Event Shirts are a Must! Organizations should give out shirts at their events, especially fundraising ones. 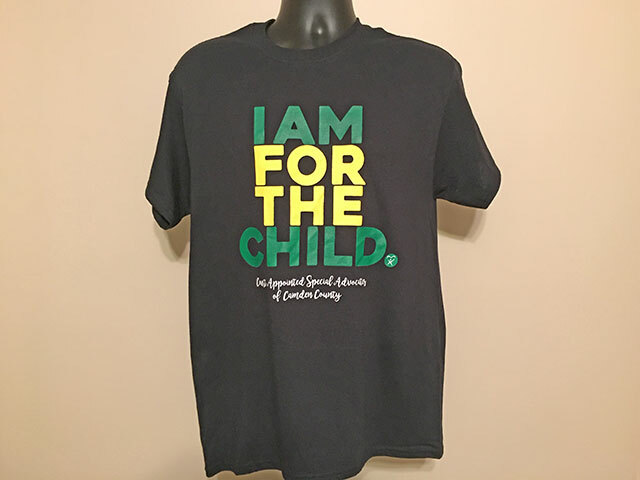 Event shirts are a great way to thank the people who come as well as promote the organization. Supporters often make those shirts collectible, too, if the event repeats. The shirts are worn for years, promoting the event and the organization. That’s a great return on the investment! But we can’t afford t-shirts! Are you sure? There’s actually an easy a way to get those shirts in your budgets, and it’s called sponsors. If you have corporate partners or big fans of your organization, ask them to sponsor the t-shirts. 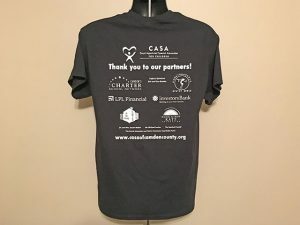 Then print their logos and names on the back of the shirts like CASA of Cumberland, Gloucester, and Salem Counties does. This excellent organization does great work to protect and care for children who need help. They fundraise and know the value of giving out event t-shirts. Sponsors fund event shirts because they believe in the work these organizations do. In return they get their names and logo on the backs of the t-shirts. I call that a win-win for both the organizations who get funded and the sponsors who get years of advertising value for supporting worthy causes. Contact Sandee HERE today for help getting YOUR event shirts set up!